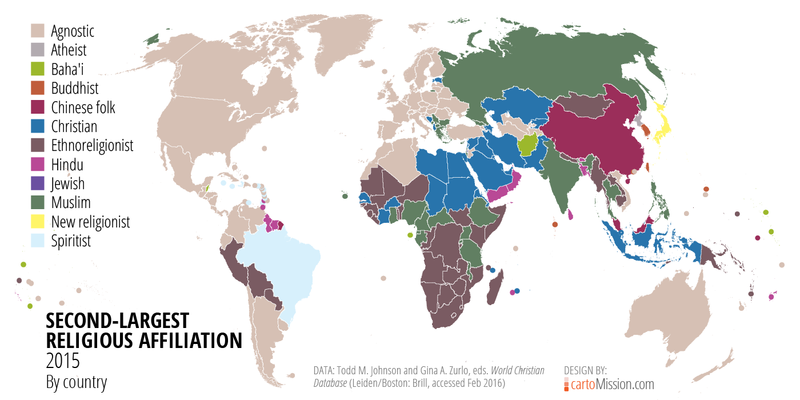 The map above shows the second-largest religion by country using data from the Center for the Study of Global Christianity. It is interesting to see what other religions have an influence on society in various nations. In many predominantly Christian areas across the Americas and Europe, agnostics are the second-largest category. In the Middle East and North Africa, Christianity is often the second-largest religion, as it is in the country of Indonesia in Southeast Asia. In Sub-Saharan Africa, ethnic religions are often the second-largest following Christianity.